Already on the first green area that you come across you can spot herbs. After careful observation you will find at least two such useful herbs and this in a very short time. All this proves just how generous nature is. This privilege not only for people from the countryside. Yes, you read it right! Priceless treasure is all around us, just pay attention to it. However, read and use only those specimens that grow in unpolluted area. Medicinal plants reap far from roads, factories and all air pollutants. The best advice on how and where to collect medicinal herbs, and the way in which to store them read below. Collection of medicinal herbs comes with the arrival of early spring (even in late winter). Then you can harvest the buds of birch, poplar, and pine. Mistletoe can also be collected immediately after pollination. Always keep in mind that the blossomed plant is much healthier than already fertilized flower. May rose is as specific medicinal herb, only developed buds are harvested, but it is important that there are not open. Leaves and plants need to be harvested immediately after you notice the first flowers. However, this does not apply to everything, there are exceptions. It is recommended that the leaves of lemon balm are harvested before bloom, because then they are the biggest and enchanting. This medicinal herb in folk medicine has a prominent place. Wormwood is also a special case, if you want to make brandy or liqueur, harvest plants up to a height of 20 cm. To prepare beneficial teas reap the tips of branches which are already in bloom. It is best to harvest them at the time when this medicinal herb has reached 1 meter in height. A detailed and informative calendar of medicinal plants is essential to every herbalists. Seeds and fruits are collected only after they fully mature. Also, there is no single solution. Eg. rose hip cannot be immature when harvesting because then it is very tough. In this case it contains small amounts of vitamin C and many will find it difficult to dry it. On top of everything it is perishable. In the early spring months it is best to peel bark. Then abundant juice is a lot easier to extract than during the fall. Always peel only young, smooth and healthy barks, not cracked and rough ones. If you are wondering when to harvest roots we know that the best period is in the fall. It is not so often collected in the spring, although there are exceptions. 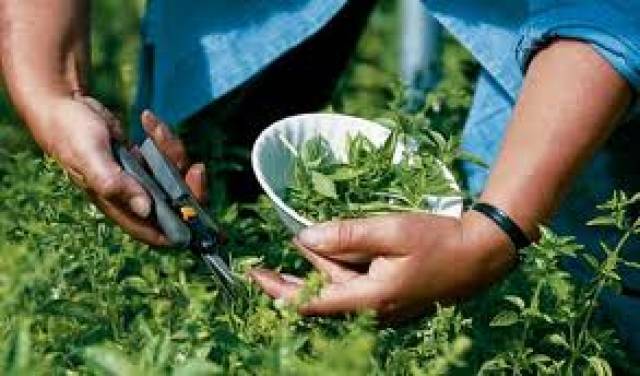 Herbaceous one-year herbs in the meadows is best to harvest during the flowering time. Perennial herbs remove only when their roots are fully developed and large. Remove rotten and dry parts, clean well from the accumulated dirt. Before using, wash with water and leave it to dry. A gently heated oven at approximately 70 degrees can make a process much faster. Flower, leaf and above-ground part of the plant should be dried in the draft and in the shade, not in the sun. This process should last as short as possible. Grass by no means should you dry mixed together, but in thin layers, on paper or canvas, and with regularly shaking. Root, seed, fruit and bark can be dried in the sun. The dried parts of medicinal plants cannot be stored indefinitely - the older, the more bad they are. As a general rule you should use them within one year after the harvesting. However this rule does not apply to peel of buckthorn. This plant needs to be dried for a year before use. Dried herbs, wrap well and store them in a dry place, which can often be ventilated. Many drugs (dried herbs) keep tightly packed. The most important causes of their deterioration is moisture, heat, sunlight, oxygen from the air, dirt and sudden changes in temperature. Also, the danger lurking is from insects, mold and bacteria. Lily, monkshood, ergot and many other medicinal herbs are particularly sensitive. They have to be kept completely dry in appropriate containers, tightly closed. Extra advice: smaller packs are a much better choice. How are plants stored and packed? Flowers, leaves and other plant parts it is best to pack in clean metal boxes, sealed. An even better choice are crates, standard size with double thick paper black and dark blue. Suitable are carton boxes. If you want to store it for even a short time, best be kept in the bags that can be closed with a zipper. This is a great choice if herbs have to be moved somewhere. Roots are packed in larger bags, and smaller seeds in bags of clean cloth. This is a way to pack dry plants for export, therefore, industrial quantities. Small amounts of expensive dried herbs should be kept in a black or dark containers. Sensitive herbs need to be packed to that they fill the container until the top. This is done so that the air gap is small as possible air to be as small as possible. Ergot, lily, digitalis, coastal arch, and other plants need to be kept whole, not in powder form. Their medicinal ingredients are rapidly changing and are lost under the influence of moisture and external factors. Pack up them in dark glass, porcelain or ceramic pots. If necessary, place them in a metal containers, you need hermetically seal it (pour paraffin or wax). Before closing the court it in put a bag of freshly baked lime, phosphorus pentoxide, or silicone gel. It will absorb all residual moisture from the air and dried plants. Many dry plants are added to various insecticidal agents. These are the paper soaked with an adhesive which has pyrethrins, DDT, pepeina, aloe or alum, mercury, chloroform and the like. So be on your guard. One of the main causes of deterioration is moisture. Therefore selected herbs need to be dried and used as soon as possible. Ingredients of digitalis and ergot lose their medicinal properties very quickly under the influence of the enzyme due to sufficient moisture. Therefore, the requirement is that, for example, digitalis should not have more than five percent moisture. Coastal onions, gelatin, starch and most drug powder are more or less hygroscopic substances, which in a humid atmosphere quickly spoils. They absorb a large amount of moisture, which is the first condition for mold development and activity of various enzymes. Sometimes these changes can be seen with naked eye. For example, a spoiled ergot can have a smell of ammonia, on white mallow appears mold and then it has a disgusting smell. Also, mustard loses its bitterness, on the bark of cinnamon you can see reddish spots, etc. On most of the dry plants, sunlight has a bad effect. Saffron, paint brushes, as well as the flowers of violets, roses, lime and others - are changing and lose their natural color, fade. If you hold digitalis in open court in brightness it will rapidly lose active properties due to the decomposition of medicinal ingredients. Ultraviolet part of sunlight have chemical effects and, in poorly sealed drugs, it can cause unwanted changes. In this way it will reduce its medicinal value or in some cases completely be destroyed. Therefore, all susceptible plants should be packed in opaque containers coated with thick with paper. Dried herbs in powder spoils much faster. Due to high fragmentation, under the influence of light and moisture milled plants will quickly lose the scent. Also, they will lose their distinctive taste and color. To top it they will lose greater amounts of alkaloids and other medicinal ingredients. All Pharmacopoeia for most medicinal herbs prescribe making the powder, just before use when needed. Powders are more hygroscopic (attracts moisture) than the corresponding drugs. Therefore, it should be kept in tightly closed containers. Therefore, in the bag or container usually added is a small quantity of anhydrous potassium chloride or other means for absorbing water. Dried parts cannot be stored indefinitely – the older they are, the worse they become. One of the main causes of powder decay is moisture, so selected herbs dry and use as soon as possible. Never harvest all herbs located in one place. The most beautiful specimens are still left for further propagation. Grass type herbs are harvested only in dry and sunny weather, because otherwise they rot due to high humidity. The most sensitive are the above-ground parts, flowers and leaves. In phytotherapy you may not use specimens that grow beside roads or industrial zones. Therefore, look for them far away of those places.